Anyone that knows me well knows that I love a good boot camp – last year I trailed out a residential bootcamp in Norfolk – I was only supposed to stay 3 days but they convinced me to stay the whole week. Some may say I’m a bit of an exercise geek, but I loved how it made me feel , I went away three pounds lighter, more toned and with way more energy. But of course I can’t just run off to a weekly bootcamp every other week (sadly!) so the fact that many of these companies have set up day or weekend boot camps in London is very exciting. First up was Prestige – I had a month until my holiday so a day’s exercise in Hyde Park seemed like just what I needed. However dragging myself out of bed on a Sunday morning wasn’t so great. But once I got there the trainers made sure any type of Sunday morning feelings vanished…..
We started with a quick warm up, and then got in teams to compete against each other. I put myself forward to go first – sprinting to the line and back, but of course my competitive steak got the better of me when I fell flat on my face on the way back. Yep that’ll teach me. After a short break, and me checking that I hadn’t done any serious injuries to myself (don’t worry only a bruised knee and ego!) we started the dreaded shuttle runs, while our partners performed a series of exercises – including squats, lunges and sit ups. After one session I thought we were done, of course not, it is bootcamp after all. Two more sessions later and we were all exhausted. After lunch and some well deserved rest time it was on to the team game – so fun, in fact, that a couple who were watching us play decided to join in. See, exercising can be fun. Then it was the painful part – the leg and bum exercises, never has my bum ached so much doing a series of exercises than on that day, I could barely walk the next day. Along with a series of abs and then arm exercises – I was ready to wobble home by the end. As always I loved talking to the other participants about why they were there, especially the particularly brave ones who hadn’t exercised for years – let’s hope it didn’t put them off and they got out of it what they wanted. 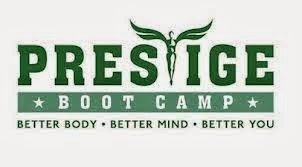 I love the idea of having bootcamps so readily available to you and prestige is just that, I’ll definitely be going back when I need another pick me up. Like the sound of it? Prestige do day bootcamps in London every month, along with residential bootcamps in the UK and abroad – check out their website here. Loved this? See how I got on at The Revival boot camp later this week…..